Nancy Gonzalez is one of my favorite designers to come out in the past few years. Her designs are never overdone, and her exotic farm-raised skins make other exotic skins look lackluster in comparison. 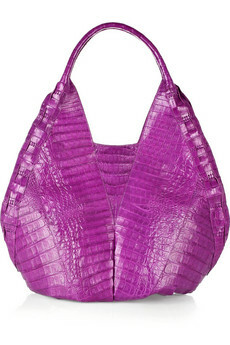 This crocodile hobo has a fabulously minimal, but still very exciting design that shows off Gonzalez's best work. The color of this bag is extraordinary. The rich jewel tone is a total knockout, and it brings the fabulous texture of the crocodile skin into incredible relief. The skin also has a great gloss on it that ensures that it catches the light in all the right places. I love the stiff, structured look of this hobo. It's got a great teardrop shape, but without any messy slouchiness. The inset center piece adds another layer of detail to the texture, and the whole thing has a very highbrow patchwork quality to it that's irresistible. $3,750 is really not unreasonable to pay for a bag of this size and quality. Gonzalez keeps costs down by using skins from animals from her own farms, and from hiring artisans in her native Colombia. The results are beautiful and more than worth the price.